Bring a pot of water to a boil and add the lentils. Turn down the heat a bit and cook for about 30 minutes, or until the lentil are just cooked. The small Puy lentils don't get mushy like regular brown lentils do. Drain the lentils and set aside. In a large skillet melt the butter and add the olive oil. Add the garlic and cumin to the pan and stir for about a minute. Add the chopped tomatoes to the pan, along with about half of the cilantro, and the lentils. Stir to combine, and let it cook for a minute. Stir in the tahini, lemon juice, 1 teaspoon of salt and lots of fresh ground pepper. Let cook gently, for about 5 minutes. Note: Ottolenghi adds a little water to the pan, I didn't need it. He also says to mash the lentils with a potato masher at this point. I didn't do that, I preferred the texture of the soft but whole lentils. It's your call. 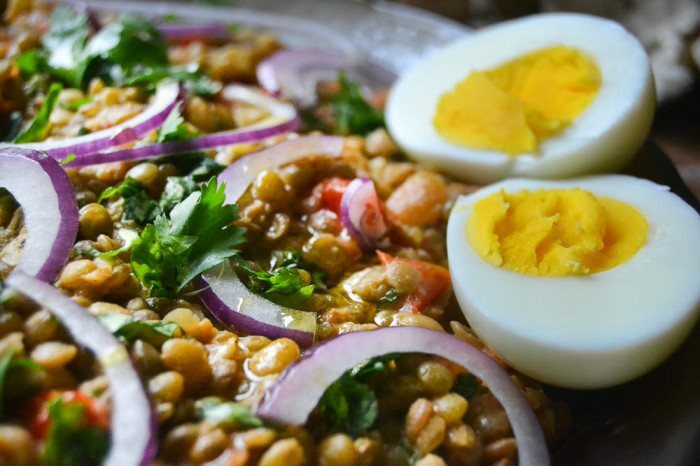 Serve the lentils hot, sprinkled with the sliced onion and the rest of the cilantro, along with the cooked eggs. Drizzle with olive oil and dust with paprika. Eat with pita bread.